According to a study by Deloitte, over 1/3 of employees will look for a new job when the economy improves. 48% of the reason to move: loss of trust in their employers. How good is the trust in your organization? Is it enough to keep good people? How do you know? Imagine a tank of water, slowly dripping away; eventually it runs dry. 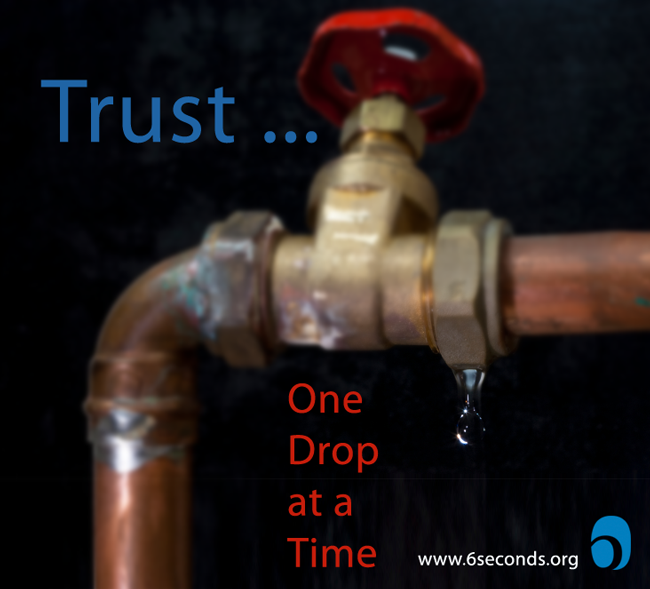 Same with employees: the loss of trust occurs one drop at a time. As it fades, performance drops — and soon your talent is draining away. Trust erodes occurs when they don’t receive credit for work done, or hear a belittling comment, or witness a broken promise. Trust dribbles away when a manager doesn’t walk the talk, or when policies are applied to one person but not another, or when they feel unimportant. No one action, on its own, drives the employee away. But when nothing is done to offset the small betrayals, the employee’s ‘bucket runs dry,’ and the result is a loss of talent. Even worse are the months before the employee is fully committed to leaving – in that time, you’ve already lost the employee, but s/he is still at your company bringing a toxic attitude to work. Get Real: Where’s Trust Leaking Now? First, assess the level of trust is in your organization. Bring in a coach or consultant to measure the levels of trust and the leaders’ ability to create it. You can also do an informal assessment by spending time communicating with others in a positive, open and non-threatening dialogues. Use the framework of the 5Cs as a basis for your inquiry. Which are fully present, which are only occasionally making an appearance? Do people know what to expect of you? If you change your mind do you let others know? You can show your consistency by matching words and deeds. Spend time getting to know others who work in your organization and take a genuine and caring interest. Show others that you care about them as a person and not just the skill they bring. If you have a problem, speak to them in private. Starve gossip and feed praise. Invest in yourself and others and continually improve yourself. Find something that interests you and be a continuous learner. Boredom in a career can eventually lead to loathing and that level of negative emotion brings with it a lot of damage. Above all communicate with people. Bring them along. This is especially important in times of economic uncertainty: decisions are made that effect livelihoods and alter the workplace, often in negative ways. In the absence of information, people fill in the blanks; the severity of whatever you have to tell them pales in comparison with the stories from their imaginations. Observe and acknowledge what has happened and reflect on the feelings that people may be experiencing. Communicate the needs that are surfacing and honestly and openly let them know what can be done. Second, restore trust where it’s broken. Remember, you’re not just doing this to be a “good guy,” you’re making an investment to be an org where talented people will come do their best work – and stay. Look at the values in your organization and consistently find ways to honor and live the values. Focus on what is working and build on it rather than focusing on what isn’t working and talking about it. Train your leaders to pay fierce attention to the value of trust, and equip them with the emotional intelligence skills to attend to trust as an invaluable emotional asset. Read more tips for building trust and try them out. There’s no “silver bullet,” it’s an ongoing commitment. The bottom line: Trust is the key to keeping and maintaining the talent in your organization. Are you doing everything possible? I quite agree, Lea!! In too many places, I notice people “Talking the Talk,” but not “Walking the Talk.” Jayne Morrison has said that training in EQ, combined with coaching is essential as individuals/leaders need to practice EQ skills. EQ skills develop over time and with repeated practice, creating new and well-worn neural pathways. Are we leaving time for this in our organizations? How are we measuring the amount of trust people feel when working in an organization? Is feedback being given to the highest level of leadership? Is there accountability? These are questions that every organization benefits from asking and answering. Hi Dr. Fatum, You bring up great points. By the time people notice trust is an issue, it is extremely difficult to bring it back. Better to create the environment where trust thrives.